Behind an unmarked door, a young woman rocks back and forth, back and forth. Part six in the Afterlife series - Mary Alice Brandon. Carlisle feels something is missing from his life. He has just created Edward to be his son and companion, but he still feels empty. He finally finds love, but he has to save her first. A one shot of when Carlisle finds Esme. Rosalie is depressed after she becomes a vampire and runs away from Carlisle and his family. What she finds is something she never expected. A 555 word drabble about the first time Jasper found Alice. Oneshot. Life. This was the topic of the day, it seemed, as my hiking boots crunched over the shady leaf-littered trail. The concept had crawled into a crevice in my mind and burrowed its way through the synapses, determined to stay there until I’d contemplated it to a satisfying degree. When the Cullens encounter a powerful vampire, there lives are turned upside down. The future collides with the past when Renesmee is thrust into a different time zone and wakes up more than just miles away from her home. While striving to make things right again, Bella falls prey to the same fate as her daughter, only this time she doesn't have Edward to help her. 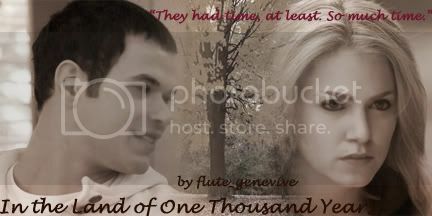 A million and one thanks to Anne Cullen for the amazing banner! Edward Cullen was born around the same time as my great-grandparents. What would have happened if they knew Edward over the course of their lifetime? Set largely in rural Kentucky, and ultimately follows all canon pairings. REVIEWERS GET CHEESECAKE!!! This will be a series of self-contained chapters chronicling Jasper's observations of Edward's emotional states throughout the series, with the first chapter being pre-Twilight. Alternatively titled "Observations of an Empath" - from Jasper's POV. The most marked difference was in my eyes; that he would notice. He told me, not long ago, that my eyes were the color of violets. And then he added some of those to the roses that he had sent to me each night. They had made me feel special, my violet eyes. They had made me different from everyone else. Better. Well, I was still special. I was still better. Only now my eyes matched the roses instead, glowing scarlet. Alice’s visions go haywire regarding Jasper. She doesn’t know if they are even soul mates even more. Jasper assures her that everything is okay, and going to work out, but Alice doesn’t necessarily believe him. Alice's POV. Royce King II gets his comeuppance. Twilight, and everything derived therein is the sole property of Stephanie Meyer. I'm just an admiring fan. Pre-Twilight. Emmett/Rosalie. A story that begins with Emmett's awakening as a newborn, and follows the secrets and hurdles of his new relationship with Rosalie, the mysterious blonde girl who saved his life. "I'm not going to hurt you," he murmured into the boy's ear. And then, before he could hesitate, he plunged his diamond-hard, razor-sharp teeth into the boy's neck. The taste of blood was almost too much, but he knew the job was done. Rosalie Hale, vampire caught desiring. She's never in her life come across anything that she wanted or needed that she didn't feel that she deserved. That is, until she comes across Emmett, the one thing she needs more than anything... and she doesn't deserve him at all. Emmett thinks he's forgotten his and Rose's 50th anniversary...but not all is as it seems. Summary: Four times when Rosalie saved Emmett (and one time she let him be the hero). Some little girls want bed time stories of princesses and dragons, or magical creatures. Alice is not prepared for little Renesmee's story of choice -- how her aunt and uncle met. Summary: What was happening in Edward's life on the day of Bella's birth? What might have happened... one-shot. A love story centered around Benjamin, one of the Egyptian coven. Set a few years before Twilight, and before Benjamin has met Tia, his mate. Hurt/Comfort, and somewhat Dark. George has a connection to Alice. He is a vampire, she a human. George swore to protect Alice and keep her safe, but what happens when another vampire appears? One that will stop at nothing to drain her blood. How does Emmett deal with the one thing he can't give Rosalie? What really happened that day? Jasper had changed quite a lot since the day he and Alice moved in. Where do you think Edward got his emo-ness from in the first place? And of course, Jasper exaggerated the part about meeting Alice. Now, here is the truth.